The ID is used through out the Rocrail program as unique key for referencing this turntable and is therefor very important. This number is used for mapping a switch command by address to this turntable for next/previous track. The grid size of the turntable. The size of the turntable has a impact on the capability to connect tracks, e.g. This option is only for turntables with a limited rotation range. (Interlocking turntables or segment tables) It will use the longer other turn direction if needed. This range must be specified in CCW (counter-clouckwise) direction. The turntable takes care of the routing to and from the track blocks. The Embedded Block option will be set automatically. The Block ID must be set for every track for generating the routes. Routes must be defined manually if the block ID for a track is empty. The blocks should be pointing with the minus side to the turntable for a correct representation. If for a track an Opposite Track is defined a reverse route will also be generated. All generated routes are temporary and will not be saved in the plan XML. can be reached that in the Route dialog with the function Remove auto generate flags. The turntable itself act like a block object and does not need an external bridge block. Bridge speed for all directions. The loco Event timer is used if the bridge only features one occupancy detection. This object can also serve as a traverser if this option is set. The SpDrS60 must be in the list of Rocview themes. 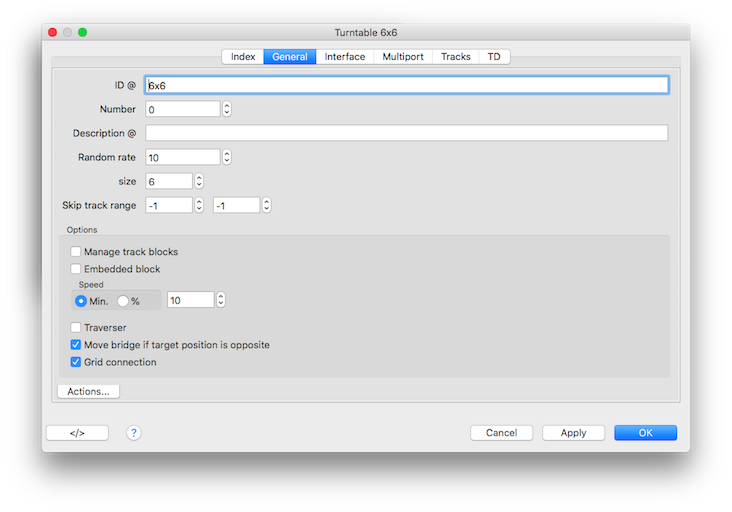 Uncheck this option if the bridge should not rotate 180° if the new position is opposite of the current position. Info: In automatic mode this option will be forced enabled. Use the Track Grid connection coordinates.